Make Super Bowl Sunday "Center Awareness Day"
I ask for your support because of how many people are not aware that the Center is the most important position in football. I first discovered this while doing a story for CNN two Super Bowls ago. I called it Journey to the Universe of the Center. My journey to Center Awareness began during a serendipitous encounter with a former Ohio State Buckeyes Center – a proud walk-on -- named Peter Miller. Until I spoke with Miller, I never realized that Centers call their own audibles – shouting out play changes to the offensive line – in codes that shift through the game – during the 30 or so seconds between the huddle and the snap -- just like a Quarterback. Miller explained how the Center’s brain has to process vast amounts of information instantly. Every play is very detailed. Often, right down to how many steps back the quarterback will take before he plants his foot and throws the ball. It's a noisy place to process information. A stadium full of fans are screaming. It's hard to hear. And all this is happening, Buckeye Miller points out, "just after you got your brains beat in and the snot knocked out of you" on the previous play. So who is the Center of the system that protects Peyton Manning? I didn’t even know until I looked it up today. Ramirez is powerful. He bench pressed 550 pounds when he played at Texas Tech. He had the humbling experience of beginning his NFL career with the Detroit Lions when that team went 0-16. He knows what it’s like to lose and learn. "You gain a lot of positives,” said Ramirez, “because it builds your character. It makes you see, you take a step back and see, what am I doing? What adjustments do I need to make? Three years ago, Ramirez was cut by the Lions. His career seemed over. Until The Broncos picked him up. Imagine the resilience Ramirez needed as this year’s training camp began. He was Denver’s right guard when he got a call from his close friend and former college roommate – fellow Mexican-American Louis Vasquez – who let Ramirez know the Broncos had just hired him to replace Ramirez at Right Guard. This was Manny’s reaction, quoted in Fox News Latino: "I was shocked, but at the same time I was excited because Louie and I got a bond that's like brothers, so I was happy for him," Ramirez said. "And then my mindset was I've just got to fight for a job." The injury that USA Today just reported more football players fear than any other injury – a knee injury – took out Denver’s Center for the season. So Denver moved Ramirez over to try him out as the new Center. Have I mentioned that the Center is the most important position in football? And everyone at the time was questioning whether Ramirez would survive. A former guard who protected Manning for five seasons on the Indianapolis Colts was hired in case Ramirez stumbled. But as they played together during the pre-season, the communication synapses between Center Ramirez and QB Manning kept improving. Peyton Manning, in this story, describes how difficult it is to be Peyton Manning’s Center – particularly in the case of Ramirez. “That is no easy task to go from guard to center, especially in a sophisticated, fast-moving, always-changing offense. I think it would be one thing if you knew what play was going to be called and you had 40 seconds to process it,” said Manning. “But we call one play and change it to the next with five seconds on the play clock and when we change a play, Manny has to make his own calls and he has just gotten better each week." 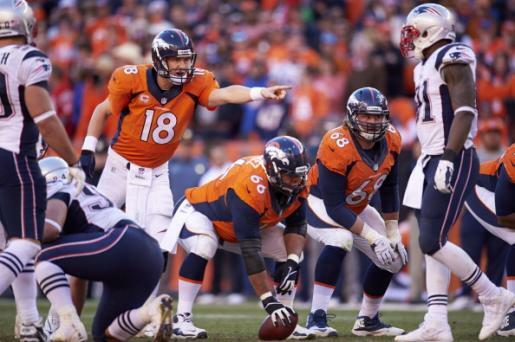 There’s extra pressure on Manny Ramirez and his offensive line – beyond adjusting to Peyton Manning’s audible approach. The neck surgeries which sidelined Manning for a year forced him to adjust his throwing mechanics. Less arm, more torso. And the need for a little extra space to step into his throw. That little extra space – the margin between a pass and a pummeling – is created by Manny Ramirez and his offensive line – which let up the least amount of sacks of any team this season. So please, read this piece I wrote for CNN two years ago, which takes you inside the world of the Center. Then fill in the white space of the story with what you see Peyton Manning do on the field this Sunday. If you follow that advice – I’m confident you’ll find it hard to keep your eyes off the Center – at least for a few plays this Super Bowl Sunday. And if you watch Manny Ramirez -- #66 -- closely – I offer this advice. Respect his 4 million dollar contract extension. But, perhaps most of all, respect the processing speed of his brain. It may be faster than anything you see on the field.